Alfred’s name will live as long as mankind shall respect the past. Winston Churchill, not usually reputed for his modesty, when being told that he must be the greatest Englishman that ever lived replied - "No! The greatest Englishman that ever lived was King Alfred". There are Iron Age hill forts, such as Segsbury Camp and Uffington Castle, Bronze Age burial mounds, Wayland's Smithy, one of the Britain's most impressive prehistoric tombs and the White Horse which gives the district its name. John Betjeman, Poet Laureate, lived in the town for many years and wrote a number of poems about Wantage and the surrounding areas for example "Wantage Bells" and "On Leaving Wantage". A Betjeman Memorial Park with a statue of the poet and several displays of his better known works occupies a wooded area a short distance from Wantage Church. 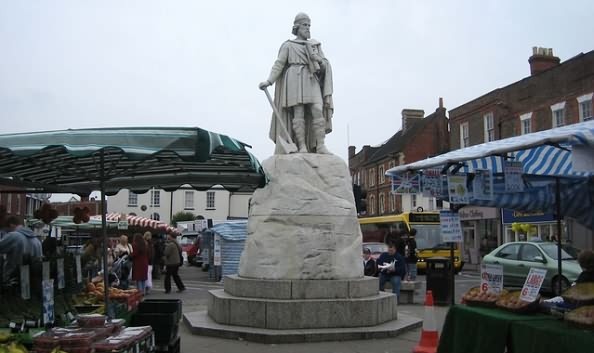 The origins of Wantage are lost in the mist of pre-history but pot sherds found by residents when digging their gardens betray the importance of Wantage as a Roman settlement. Nearby villa sites and burials confirm the significance of this evidence and an important Roman road ran south from Oxford through Frilford to Wantage. Wantage appears in the great Domesday survey of 1086. Its value was £61 and it was in the King's ownership until Richard I passed it to the Earl of Albemarle in 1190. The manor eventually passed to the Fitzwaryn family. The town developed at a slower rate than Abingdon, maintaining older fashions of architecture for a longer period than its neighbour. From the early 17th century, it became a large centre for the processing of leather with all the pollution and smells that this trade brought.